I made these egg muffins a couple of days back on a weekend when I was looking to make something that was a little different from our usual breakfast fare. I also wanted something that would be simple to prepare, quick and filling. I came across this recipe on Lisa’s blog and decided to try making eggs her way. I made a few changes to the original recipe. This recipe yields 8 medium sized egg muffins. Grease a medium sized muffin tray with a little bit of butter. Spoon a little cornmeal into each greased cup, just enough to cover the bottom. In a large bowl beat the eggs well, add the milk and stir in the remaining ingredients. Mix well. Pour the egg mixture into each muffin cup and fill each one almost to the top. Bake at 350 degrees F for about 20-25 minutes (check after 20 minutes) or until the muffins begin to puff up and become slightly firm to the touch. Serve hot and wash it down with this smoothie. looks yummy and very colorful. The pic look gorgeous. Thanks for sharing with all of us. Ohh these look positively pretty! !Love the idea. Very nice idea & its looks yum too! A different look to the same old egg right? What a great way to start the day. I usually have toasts in the morning but should try this. They look ever so colorful, with the confetti-like veggies all over them! Got to try this soon :) nice portable breakfast. These are great! I love baked egg dishes. I will have to make this one! What a lovely variation to the plain ole omelet. Looks really good. Glad these worked out for you. I like your modifications. The possibilities for these egg muffins are endless. 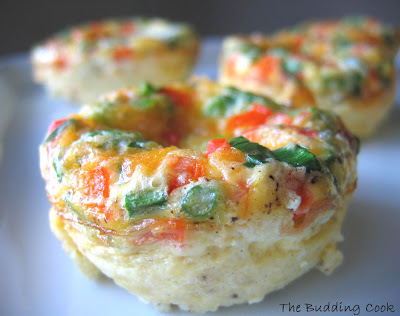 These look so good...almost like little quiche. Those look great, I love how colorful they turned out! I dont cook with eggs, yet I am getting so tempted tbc. They are just awesome. Egg muffins! Lovely! Nice colours..
You have such a beautiful blog- the pictures are absolutely captivating. Thanks for visiting my blog- I am glad I found you! Hima- thank you:-). You could substitute the eggs with the latest craze around here- tofu:-)I'd seen a recipe for it somewhere and remember thinking it was a great idea. And it only needed 5-10 min of preparation, the oven did the rest. I think I spent more time taking the pics than actually making it. Vaishali- thanks for visiting. I am glad I found your space too through TOI. They look so light, fluffy and pretty! Will definitely give it a try, I saw some on Kalyn's blog too. We love muffins(or quiche ). Lovely pictures!! We also add spinach and mushrooms. Eggs are certainly allowed in my diet and I'm looking for different ways to prepare it other than omellette and scrambled eggs. One question... Can I use egg substitute for eggs. Your muffins are so colorful and tempting. Nice job done. I really have no idea how that would turn out. I remember trying the substitute once(not in this dish) and not liking it. You could use soft tofu though...I had even seen a recipe somewhere that substituted the eggs with tofu. I tried these today and they were so good, my hubby who usually does not like egg much loved these. 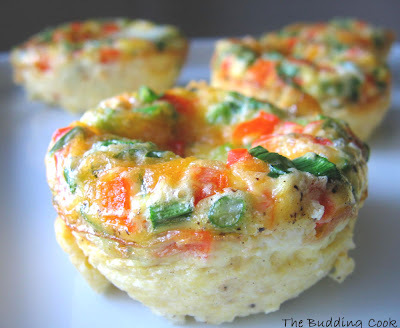 I put in different veggies, what were in hand but it is such an easy breakfast idea, Thanks for sharing. I am so glad to hear that you tried something along these lines and liked it. Thank you so much for letting me know!